Joseann Alexie Offerman (born March 10, 1994) is an American ring announcer, valet, former professional wrestler and singer. She is signed to WWE under the ring name JoJo on the Raw brand. She was part of the E! Network reality television show Total Divas during the first season, which aired in 2013. She is currently on hiatus due to pregnancy. Offerman was born on March 10, 1994, in North Hollywood, Los Angeles, California. In May 2013, Offerman joined WWE and E! Network's reality show Total Divas, which shows behind the scenes footage of select WWE Divas and a look into their personal lives. At just 19 years old, Offerman made her main roster debut under the ring name "JoJo" on the June 26, 2013, episode of WWE Main Event, singing the entrance theme for Tons of Funk alongside The Funkadactyls (Cameron and Naomi). Her version of the song was later released on iTunes. The following week on Raw, JoJo appeared in a backstage segment also involving The Bella Twins, Natalya, The Funkadactyls, and Eva Marie. On the July 22 episode of Raw, JoJo along with the cast of Total Divas appeared on Miz TV, where she introduced herself to the crowd. JoJo sang the United States national anthem at SummerSlam on August 18. On the August 26 episode of Raw, JoJo served as the special guest ring announcer during a singles match between Natalya and Brie Bella. After the match, WWE Divas Champion, AJ Lee interrupted Brie Bella's victory celebration by cutting a worked shoot promo on the cast of Total Divas. Following this, JoJo appeared at ringside to show support for her Total Divas co-stars during their matches. JoJo was booked in her first match on Raw on October 7, teaming with Natalya and Eva Marie in a winning effort against Alicia Fox, Rosa Mendes, and Aksana in a six diva tag-team match, however she was never tagged into the match. The Total Divas defeated The True Divas (Fox, Aksana, Divas Champion AJ, Kaitlyn, Mendes, Tamina Snuka and Summer Rae) in a elimination tag-team match at the Survivor Series pay-per-view, and the following night on Raw in a rematch, where she achieved her first in-ring victory after pinning and eliminating Tamina Snuka. JoJo later moved to WWE's developmental territory NXT in late 2013, after it was confirmed she would not be returning to Total Divas for its second season. She subsequently became the ring announcer for NXT. In April 2015, JoJo was promoted to the main roster and began serving as the regular ring announcer on Main Event, SmackDown, Raw and pay-per-views as well as a backstage interviewer. Offerman was part of the main cast for the first season of the reality television show Total Divas produced by WWE and E!. The show began airing in July 2013. Offerman was replaced by Summer Rae for the second season. Offerman is the daughter of former professional baseball player José Offerman. She is of Mexican and Dominican descent. She is in a relationship with WWE wrestler Bray Wyatt and on March 27, 2019, Offerman announced via Instagram that she is pregnant, and is expected to deliver in June. ^ a b c d "JoJo profile". The Internet Wrestling Database. ^ Pike, Ryan. "Total Divas TV report". Wrestling Observer Newsletter. Retrieved December 22, 2013. ^ "E! and WWE to team up for launch of 'Total Divas' reality show". WWE. Retrieved April 22, 2013. ^ Neuenschwander, Andy (June 26, 2013). "Total Divas Sneak Peak, Bellas Body Slams and Big Egos". E! Online. Retrieved June 30, 2015. ^ Richard, Trionfo (July 1, 2013). "WWE Raw Report: champions versus champion; rematches from SmackDown; the cast of Total Divas together; Daniel Bryan as a referee; those nutty McMahons; the family comes along to Baltimore; and more". Pro Wrestling Insider. Retrieved July 27, 2013. ^ Benigno, Anthony (July 22, 2013). "Raw results: Daniel Bryan runs the gauntlet and "The Best" baits "The Beast"". WWE. p. 6. Retrieved July 27, 2013. ^ "Raw results: Bryan suffers corporate justice against Orton and The Shield". WWE. ^ James Caldwell (October 7, 2013). "Caldwell's WWE Raw Results 10/7 (Hour 1): Battleground PPV fall-out, WWE Title match to continue at next PPV, one "firing," Bruno Sammartino, more". Pro Wrestling Torch. Retrieved October 7, 2013. ^ Mike, Johnson. "Complete WWE Survivor Series blog, or... Daniel Bryan is sorely missed in the main event picture". Pro Wrestling Insider. Retrieved November 24, 2013. ^ Zach, Linder. "Natalya, The Bellas, The Funkadactyls, JoJo & Eva Marie def. Divas Champion AJ Lee, Tamina Snuka, Kaitlyn, Rosa Mendes, Summer Rae, Aksana & Alicia Fox". WWE. Retrieved November 24, 2013. ^ Trionfo, Richard. "Live, ongoing, WWE Raw report: 14 Divas elimination match twice in two days". Pro Wrestling Insider. Retrieved November 25, 2013. ^ "Lilian Garcia undergoes knee surgery". WWE. April 17, 2015. ^ Caldwell, James (July 12, 2013). "WWE News: WWE & E! announce "Total Divas" details, number of episodes, male cast members". Pro Wrestling Torch. Retrieved December 22, 2013. ^ "New cast member for Total Divas". Wrestling Observer Newsletter. Retrieved January 27, 2014. ^ Martin, Adam (January 27, 2014). "New cast member for new season of "Total Divas"". WrestleView. Retrieved February 2, 2014. ^ "WWE: Somebody Call My Momma - Single". iTunes. Retrieved December 27, 2015. ^ Saxton, Byron (June 11, 2015). "NXT 10-Count: JoJo". WWE. Retrieved June 12, 2015. ^ "Joseann Offerman". Twitter. Retrieved July 8, 2015. ^ Daniels, Tim (March 27, 2019). "WWE Announcer Jojo Announces Pregnancy with Boyfriend Bray Wyatt". Bleacher Report. 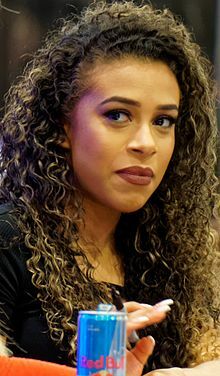 Wikimedia Commons has media related to JoJo Offerman.